We are very proud to announce the release of Jimmi-Wood's album "Into the Outside"! Into the Outside is a tribal techno oblation; an exploration of mystical states induced by unbroken concentration on hypnotic aural stimulus. Deep rhythm leads us in. Eyes rolled back, the trance is initiated. sensory impressions of another plane are transmitted' synesthetically. Each track is a unique and dynamic tale of living and breathing entities progressively revealing their presence to the experient. Jimmi-Woods' extant spirituality is always present in his work, and dictates the underlying concepts presented therein. The medicament administered by the elder shaman is a mixture of atmospheres that float between tech infused tribal drums and psychedelic sounds, organically woven together. presented by our beloved Jimmi-Woods and the Slice collective. 31st of March @ Loop Project Space & Bar. 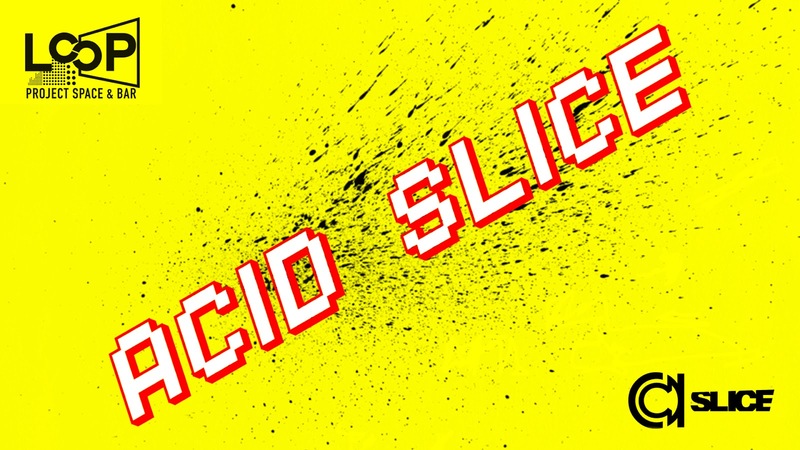 This is ACID SLICE, Melbourne's only 100% ACID night. 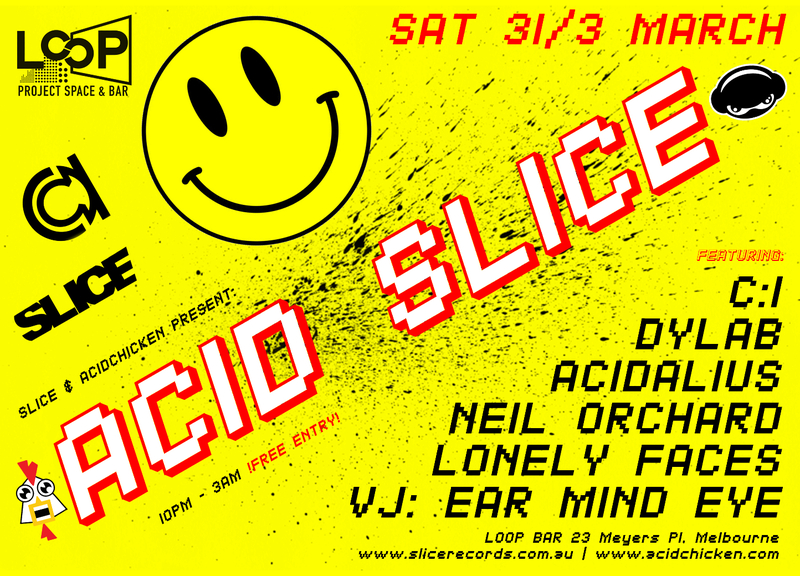 This month's ACID SLICE line up mixes live acid performances from Acidalius and dyLAB, exclusive acid dubplates from Lonely Faces and pure acid sets from C1 and Neil Orchard. As well as treating your ears, Ear Mind Eye will be treating your eyes with 303% pure visual delights. For number freaks the date is 313 so expect some Detroit specials especially from C1. As we hit the 1st of April expect plenty of tomfoolery. it. dylab's 'Submission' is just a Slice of what this talented and prolific local artist has to offer for lovers of acid techno. 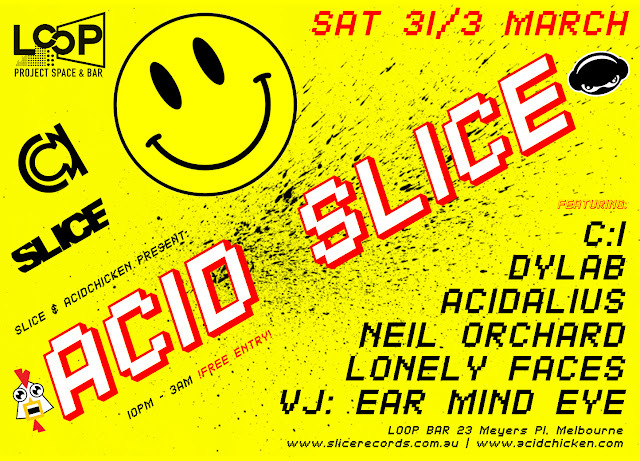 He is an English born but Melbourne based acid music producer. Described as a “box banger”, he likes to tinker with his collection of analogue synthesisers and drum machines. He manipulates the sounds that come out of these machines, and shapes it into what some call essential melancholic dancefloor music. This music should be listened to in dark clubs or darker rooms. Over the past 10 years he has crafted a solid body of music, releasing tunes on such labels as Acid All Stars, Handmade Acid, BWLR, Council House Records, Clan Destine Records, New York Haunted, Balkan Records, and TRAX, in addition to his own self released work via his Bandcamp site.